Prominent & Leading Exporter from Rajkot, we offer water cooled pumping set. Offering wide range of high quality water cooled 3*3 pumping sets. 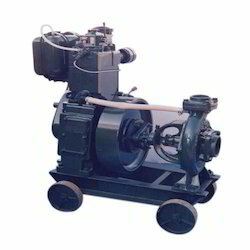 The high speed water cooled diesel engine offered by us are fabricated using superior quality raw material to have high durability and low maintenance. These are designed and fabricated keeping in mind the suitability of applications and is highly acknowledged for superior performance and noiseless operations. Looking for Water Cooled Diesel Engine ?